Sandy and I have been lucky enough to experience the ‘dream’ of sailing the world’s oceans, limited only by imagination. We picked Black Diamond up in La Rochelle, France. 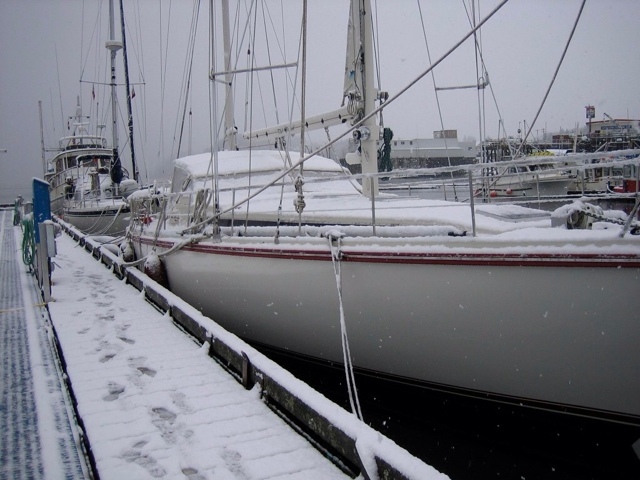 Sandy’s first big sail was crossing the Atlantic, 16 days – 22 hours, she recalls. We started the crossing from the Canaries and made landfall on the island of Guadalupe in the Caribbean. A jackets to shorts trip. After transiting the Panama Canal and dodging endless lightening strikes we spent five months in Costa Rica. Still dark with suntans here we are in Prince Rupert, BC. waiting for the weather to clear to head ‘north to Alaska’. Another shorts to, this time, parka trip. Just shows you gotta be flexible and that crusing isn’t all sunny beaches and palm trees. This entry was posted on January 1, 2013, 5:59 pm and is filed under Uncategorized. You can follow any responses to this entry through RSS 2.0. You can leave a response, or trackback from your own site.